This is a very surprising and complex read. Taking on a retelling of a story such as Faust is a challenge fraught with danger; but to accomplish such a feat with a fresh story that still manages to pay homage to the original work is simply mind-blowing. One of the best things about this book is Madame Vileroy, the demon/governess. She never really showed her true evil. She was always just off of center stage, a dark shadow, a whispered voice, a gentle push in a less than wholesome direction. She was always there, bargaining with each of her five charges, tempting them with hints of power and influence that seem to work to their advantage while really giving her power over them and indebting them to her. Her manipulation of the children is slow, with consequence and detriment to each over time. This element is so subtle that readers are completely shocked by the time that they realize the amount of damage that has been done to and because of the Faust children. The looming question of this read: Who is Madame Vileroy? This question leads reads on a treasure hunt of sorts, full of clues dotted throughout the story. The character and audience are allowed to arrive at the answer in the same moment, which only adds to the climax to this read and a showdown between a most unlikely person and Vileroy. 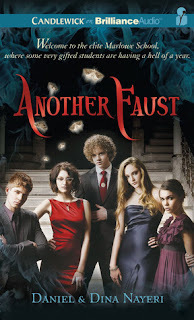 The Faust children find themselves at a school for the elite of New York. Thanks to Madame Vileroy, it appears that they have all they need to get ahead. These characters are written in such a way that you can't help being sympathetic to their plights even though you see them coming. It is through reading them that readers are allowed to explore the question of "what price is too high"...for "success at any cost"? This book is the first in the "Another" series. I am so happy to say that I experienced this book via audio with Katherine Kellgren narrating. She did a stellar job with all of the voices and accents. She made this story come alive and I hung on every word. Sold! This is on my TBR, I love the sound of this.